Nic Asher has said he and 49er partner Fynn Sterritt will receive coaching from former world champion Ben Rhodes. after a 12-year partnership which included a 2007 world title. Asher, a former world champion in the 470, has said Rhodes and Morrison's absence is also a benefit for his own Olympic qualification hopes. "They're always going to be one to beat. So it is good that they've gone," he told BBC Radio Suffolk. "They're the experienced team in the class. They've been world champions and they've been to the Olympics twice." 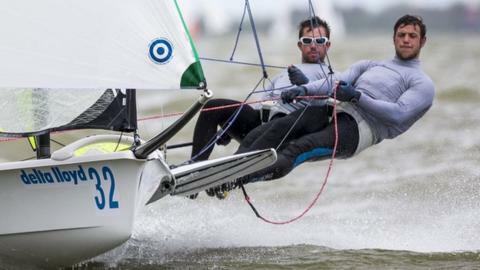 Rhodes is working with the Royal Yachting Association to train development talent and will look to coach Lowestoft's Asher, who only towards Rio 2016. It has been a mixed first season for Asher and Sterritt, who ended the year 30th in the world, after a 16th-place finish in the European Championships and an underwhelming 44th at the world championships. Their performance at the worlds was hampered by a late decision to change settings to the mast. "The result was disappointing. Not what we wanted at all. We should have been looking at the top 20," said 29-year-old Asher. "It was good to see the level. It has been a learning year to find out what it's all about and where we are. "We've had two weeks off after the worlds, thought about it all and come up with some areas where we think there's massive gains." Despite winning two world titles in the 470, Asher has never been to an Olympic Games. And only one British boat can go to Rio, from a field of five. "There's always British boats. The strength in depth is always really strong. Qualifying is the hardest thing," he said. "If you're trying to be the best in the world it doesn't really matter who they are."